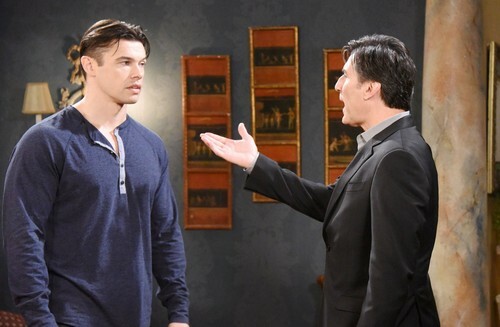 Days of Our Lives (DOOL) spoilers tease that a stunning return is on the way. There’s been some DOOL buzz about a big comeback and we now know who’s about to show up. Paul Telfer will appear as Xander starting May 14, so that’s definitely something to look forward to. Many Days fans go crazy for this ruthless villain. He’s sneaky, handsome and always brings plenty of drama. Xander was last seen on the NBC soap in August 2017, so it’s great that he’s getting back in the action. It’s been far too long! What kind of trouble will Xander stir up during his next stint? Let’s look at what we know so far. Days of Our Lives spoilers say Chloe (Nadia Bjorlin) will run into Theresa (Jen Lilley) in Mexico. Miguel (Phillip Anthony-Rodriguez) abducted Chloe for the same drug lord who’s holding Theresa hostage. Of course, we’re talking about the infamous El Fideo. Theresa and Chloe will work together to score their freedom, but a familiar face will catch them off guard on a new Days episode May 11. That’ll be a Friday cliffhanger, so we may just see Theresa’s jaw drop over the person standing off screen. On Monday, it sounds like Xander will step forward and take center stage. Days of Our Lives spoilers suggest that Xander will cause some complications, but he could actually be there to help. DOOL viewers will recall that Victor (John Aniston) sought Xander’s help with killing Deimos (Vincent Irizarry). Nicole (Arianne Zucker) beat him to the punch, but Xander would’ve followed Victor’s orders if she hadn’t. Victor has also been concerned about Eve (Kassie DePaiva) and Brady’s (Eric MArtsolf) relationship. He wasn’t exactly Theresa’s biggest fan, but he has to pick the lesser of two evils here! Plus, Victor at least respects Theresa for protecting her loved ones. He recently called Shane (Charles Shaughnessy) for updates on Theresa’s mission. Perhaps Victor will take matters into his own hands and send Xander to save the day. Days spoilers say Xander will have scenes with Tate (Colin Schroeder) as well, so he may be the one who sets up Theresa’s reunion with her little boy. Can Xander be trusted? Theresa will certainly hope so! We’ll give you updates as other Days news comes in. Stay tuned to DOOL and don’t forget to check CDL often for the latest Days of Our Lives spoilers, updates and news.